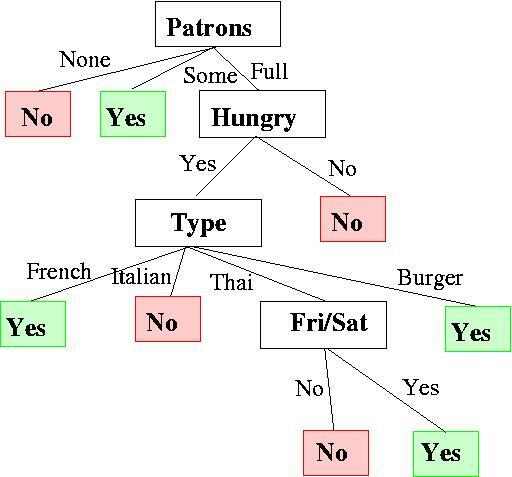 A Decision Tree takes as input an object given by a set of properties, output a Boolean value (yes/no decision). 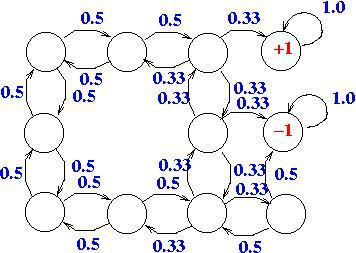 Each internal node in the tree corresponds to test of one of the properties. Branches are labelled with the possible values of the test. Learning element: Algorithm that builds up the decision tree. Problem to wait for a table at a restaurant. A decision tree decides whether to wait or not in a given situation. Hence Decision tree corresponds to conjunction of implications. Functions like parity function (1 for even, 0 for odd) or majority function (1 if more than half of the inputs are 1) end in large decision trees. Occam's razor: The most likely hypothesis is the simplest one that is consistent with all observation. Finding smallest decision trees is intractable, hence heuristic decisions: test the most important attribute first. Most important = makes most difference to the classification of an example. Learned tree is smaller (no test for raining and reservation, since all examples can be classified without them). Detects regularities (waiting for Thai food on weekends). Can make mistakes (e.g. case where the wait is <10, but the restaurant is full and not hungry). Question: if consistent, but incorrect tree, how correct is the tree? Collect a large set of examples. Divide it into two disjoint sets: training set and test set. 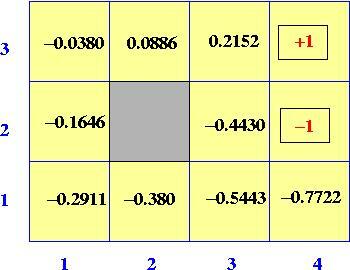 Learn algorithm with training set and generate hypothesis H.
Measure percentage of examples in test set that are correctly classified by H.
Repeat steps 1 to 4 for different sets. 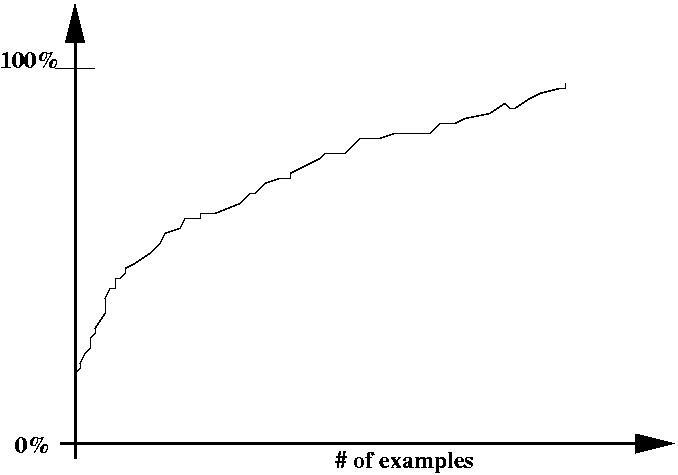 Learning curve shows increase of the quality of the prediction, when training set grows. ID3 used to classify boards in a chess endgame. ID3 had to recognise boards that led to a loss within 3 moves. Classification of half a million positive situations from 1.4 million different possible boards. Typical learning curve as result. Building up an expert system for designing gas-oil separation systems for oil platforms. gasoil XPS of BP with 2500 rules. Building by hand: 10 person-years, using decision-tree learning 100 person-days. Learning to fly: Flight simulator, generated by watching three skilled human pilots. 90,000 examples and 20 state variables labelled by the action taken. Extract decision tree which was translated into C code. Program could fly better than its teachers. e.g., if we know already the outcome by 99%, the information of the real outcome has the (expected) information of: I(1/100,99/100)=0.08 bits. If we know outcome by 100%, no additional information, I=0. 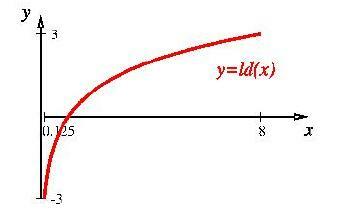 limx-> 0+x*ld (x) = 0. Choose attribute with largest information gain. possibility: decision tree pruning by detecting irrelevant attributes. Irrelevant = no information gain for an infinitely large sample. null hypothesis, assumes that there is no underlying pattern. Only if significant deviation (e.g more than 5%) attribute considered. Probability for a transition to a neighbouring state is equal among all possibilities, i.e. Assume utility function is additive, i.e. with e.g. pected utility of a state is the expected reward-to-go of that state. Decision Tree Learning: very efficient way of non-incremental learning space. It adds a subtree to the current tree and continues its search. It is highly dependent upon the criteria for selecting properties to test. It can be extended to deal with noise. Reinforcement Learning: incremental learning approach. We could only give a glimpse of reinforcement learning. We looked only at the example of a passive agent, which observes the world. Typically you will have an active agent, which can make decisions based on its partial knowledge of the world. An active agent has to decide whether it should exploit its current knowledge, or explore the world. S. Russell, P. Norvig. Artificial Intelligence - A Modern Approach. 2nd Edition, Pearson Education, 2003. Sections 18.3 & 21.2. G. Luger, W. Stubblefield. Artificial Intelligence - Structures and Strategies for Complex Problem Solving. 2nd Edition, The Benjamin/Cummings Publishing Company, 1993. J.R. Quinlan, Induction of Decision Trees. Machine Learning, 9(1):81-106, 1986. J.R. Quinlan, The effect of noise on concept learning. In Michalski et al., eds., Machine Learning: An Artificial Intelligence Approach, Vol. 2. Morgan Kaufmann. 1986. The URL of this page is http://www.cs.bham.ac.uk/~mmk/Teaching/AI/Teaching/AI/l3.html.